mig wrote: don't they bother making team change colours that clash with the classification jerseys anymore? like 'once' changing to pink each year? cannondale-drapac is similar to the points this year. or is it only yellow that matters? The only reason yellow matters is the sponsors being unhappy with criticism. Teams are only allowed to ride in alternative colours for one race a year, so why would they want to ride the most famous race not in their usual kit, just to avoid conflicting with a minor jersey colour? A better solution would be to make the minor jerseys more distinctive, like the mountains at the Tour and Vuelta. i was thinking that the tour would make them change whether they liked it or not. the green isn't what i'd call minor. mjr wrote: A better solution would be to make the minor jerseys more distinctive, like the mountains at the Tour and Vuelta. The Tour doesn't have the clout at the moment. In the ProTour/WorldTour system, they agree to take the top division of teams and only invite the four or so second-division squads (this year Wanty GG, Fortuneo-Oscaro, Direct Energie and Cofidis). Organisers ASO occasionally threaten to downgrade it to Europe Tour in order to have more control, but it's not happened yet. They did withdraw from the system in 2008 so they could ban Team Astana which was collapsing into doping hell, but even then I think a fudge was found and they invited all others. When ONCE were at the Tour, I think it was all-invitation. I'm not sure whether ASO required ONCE and others like Mercatone Uno to change from yellow, but they probably were happy with it. ONCE became Liberty Seguros which became Team Astana which didn't become the current Astana Pro Team but involved some of the same people. Like it or not, the major jersey at the Tour is the yellow General Classification leader. All other competitions are secondary or minor. Apparently the sponsors of the white jersey aren't happy with Sky being in white this tour, something I'm assuming they've done either for marginal gains, or to try and flog more replica jerseys. 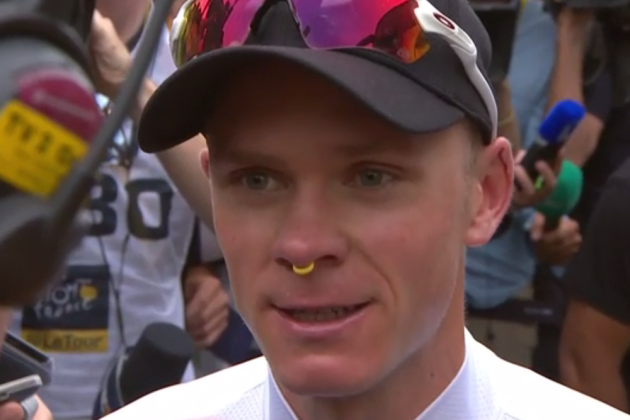 I've just seen a post-stage interview with Froomy; does anyone know what the heck that thing was in his nose???? Post stage jury jiggery pokery at work; French bloke isn't penalised (even though he did the same thing as others that were) and keeps stage win...? astonishing....??? Brucey wrote: I've just seen a post-stage interview with Froomy; does anyone know what the heck that thing was in his nose???? ps how many riders are using disc brakes? i saw gilbert going back to his car fairly early in today's stage and noticed that he was. i'd like to see how they get on in the mountains, or if riders change away from them for those stages. mig wrote: ps how many riders are using disc brakes? i saw gilbert going back to his car fairly early in today's stage and noticed that he was. i'd like to see how they get on in the mountains, or if riders change away from them for those stages. 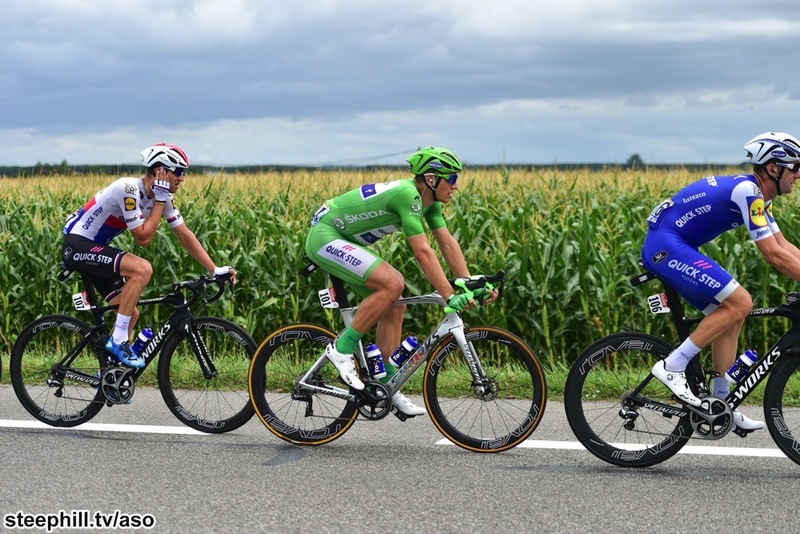 Marcel Kittel has also been riding with discs, but appeared to have gone back to DPs for stage 12 (although, understandably, there aren't a lot of photos of him on stage 12). i think his bike is really ugly there. hey ho. signs of getting old i guess. i suppose that it's possible that riders are sent out on certain equipment on certain stages to parade equipment for sponsorship, rather than racing, reasons. didn't exactly seem to work for him on that stage...? Even if it actually works on the bike, is he being paid to wear it during the interview, I wonder...? Brucey wrote: Post stage jury jiggery pokery at work; French bloke isn't penalised (even though he did the same thing as others that were) and keeps stage win...? astonishing....??? cracking stage yesterday and a cracking stage today! Team Sky were absolutely solid under pressure today; shame that the local crowd booed Froomy as he was chasing back on after a puncture. Q. Kwiatkowski's 31s wheel change/gift to Froomy was pretty swift. Would he have been significantly (i.e. yellow jersey-losingly) slower if disc brakes had been in use? Yep..................Sky guys have metal................I wouldn't expect anything less from Froomey. The finish is hotting up like the Giro (IIRC) Anything can happen.